Please see the previous article at http://ponnadi.blogspot.in/2013/12/virodhi-pariharangal-6.html. sayanam means sleeping, resting and lying down. In srIvaishNava paribhAshai it is said as "kaN vaLargai" (கண் வளர்கை) similar to bathing is said as "nIrAttam" (நீராட்டம்). Quite a few obstacles are listed in this topic. Let us see them now. Sleeping at samsAris' (materially minded persons) homes is an obstacle. mumukshu means one who desires for mOksham. samsAris are the ones who are not desiring for mOksham. nammAzhwAr defines the life-cycle of a samsAri in thiruviruththam first pAsuram itself "poy ninRa gyAnamum pollA ozhukkum azhukkudambum" (பொய் நின்ற ஞானமும் பொல்லா ஒழுக்கும் அழுக்குடம்பும்) - Out of ignorance repeatedly performing sinful deeds and as a result being born with a material body repeatedly. Sleeping or lying down with them. Sleeping or lying down on their bed. Sleeping at a lower platform compared to samsAris (For example: them sleeping on a bed and us sleeping on the floor). Giving them space to sleep. Not sanctifying the place where they slept. Not sleeping at srIvaishNavas' homes. Translator's note: When given the opportunity one should sleep at a srIvaishNava's home considering that it is a great fortune. Lying down with them considering that they are equal to us. Translator's note: We should always consider other srIvaishNavas greater than us. Lying down on their sacred bed without respecting the same. Hesitating to lie down near their lotus feet. Lying down on a higher platform than them (For example: them sleeping on the floor and us sleeping on the bed). Lying down without providing appropriate space for them to sleep. Sanctifying their place after them sleeping at a place and waking up. Translator's note: It is common practice to purify/sanctify where we slept at night if we need to use that space in the day time. Usually, water is poured and the place is fully cleaned. But since we should consider other srIvaishNavas to be pure, we should not do such sanctifying where other srIvaishNavas slept. vihitha vishayam means enjoyment that is prescribed/allowed in sAsthram - even that is an obstacle. Here it indicates a srIvaishNava's wife (or husband for the srIvaishNavi). One cannot sleep/lie down with his wife thinking that this communion is allowed in sAsthram and is to be enjoyed. Translator's note: piLLai lOkAchAryar explains in srIvachana bhUshaNa dhivya sAsthram 101st sUthram "maRRaiyiruvarkkum nishidhdha vishaya nivruththiyE amaiyum; prapannanukku vihitha vishaya nivruththi thannERRam" (மற்றையிருவர்க்கும் நிஷித்த விஷய நிவ்ருத்தியே அமையும்; ப்ரபந்நனுக்கு விஹித விஷய நிவ்ருத்தி தன்னேற்றம்) - mAmunigaL explains this high principle in his usual beautiful way. 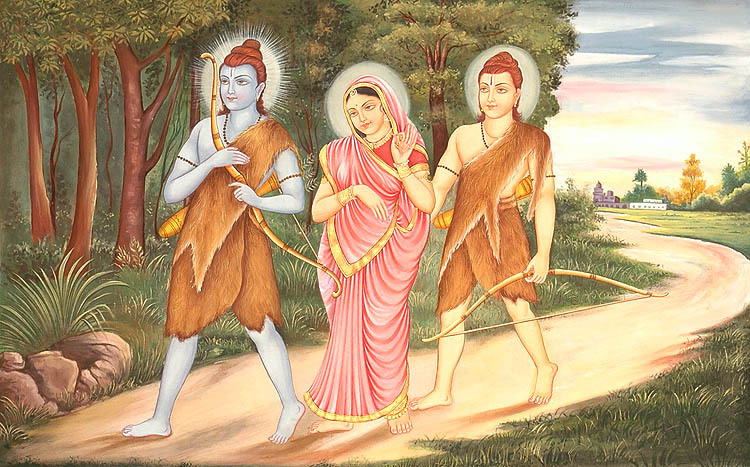 For the ones who are attached to material benefits and for the ones who are following upAyAntharams (karma, gyAna, bhakthi yOgam) - being detached from others' wives is sufficient (i.e., hankering for others' wives is condemned in sAsthram generally). Others enjoy communion with their own wives to fulfill their dharmam (of bringing about procreation), but for prapannas such communion is considered as a hindrance for their svarUpam (nature), so even that should be avoided. It is further explained in other granthams such as vilakshaNa mOksha adhikAri nirNayam by eRumbi appA that our pUrvAchAryas even though were the most advanced prapannas, yet engaged in such communion for a few days with utmost compassion to procreate one or two srIvaishNava santhAnam (children) without any desire for personal enjoyment and subsequently fully gave up such acts also and fully spent their time in bhagavath vishayam only. This is a complicated subject matter and one needs to properly hear the principles from an AchArya. Considering that ones wife is also a srIvaishNavi, one should accompany her while sleeping without any desire for enjoyment. Not having such good thoughts is an obstacle. One should not sleep with thoughts that stimulate sensual pleasures. Not sleeping with remembrance of bhagavAn is an obstacle. 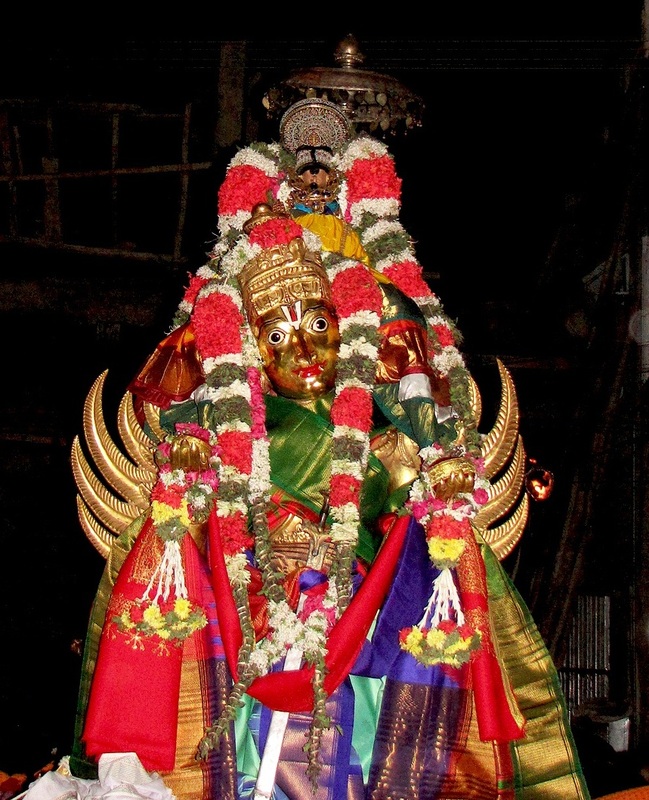 Translator's note: While going to sleep one should meditate on pAsurams such as periyAzhwAr thirumozhi "uRagal uRagal" (உறகல் உறகல்), "panikkadalil paLLi kOLai" (பனிக்கடலில் பள்ளி கோளை), "aravaththamaLiyinOdum" (அரவத்தமளியினோடும்), etc. For pancha kAla parAyaNas, sleeping is supposed to be the communion of jIvAthmA and paramAthmA (the vaidhikas day is divided in to 5 parts and the last part is called yOgam) - remembering bhagavAn's names, forms, auspicious qualities, etc., before going to sleep is of great importance. Not sleeping with remembrance of ones own AchArya and other pUrvAchAryas is an obstacle. Translator's note: Similar to previous point, one should recite AchAryan thanians, vAzhi thirunAmams, etc., before going to sleep to remind oneself of the great favours done by AchArya in establishing the connection with bhagavAn. Sleeping with thoughts about our bodily activities is an obstacle. Not sleeping with thoughts about the soul and its nature is an obstacle. Translator's note: As discussed in previous activities, one should consider the soul to be a servitor of bhagavAn and bhAgavathas and thus have thoughts that are in line with such attitude. While sleeping/lying down, one should not stretch their feet towards the presence of bhagavAn, bhAgavathas and AchAryas. While sleeping/lying down, one should not stretch their feet towards the direction of temple, thiruvArAdhanam room in ones own homes and the mutt/thirumALigai (residence) of AchArya. One should not sleep when one is supposed to be engaged in AchArya kainkaryam. One should not sleep before the AchArya goes to sleep. One should not continue to sleep, when the AchArya tries to wake him/her up. Translator's note: Sleeping may be considered as a casual activity. But as in every activity, one should carefully analyse the various aspects. As highlighted before, a vaidhika means the day is divided in to five parts - abhigamanam (waking up, morning routines), upAdhAnam (collecting raw materials for thiruvArAdhanam), ijjA (thiruvArAdhanam to our home perumAL), svAdhyAyam (learning/teaching of ubhaya vEdhAntham) and yOgam (resting - communion of jIvAthmA and paramAthmA). The yOgam part is what we normally consider as sleep and when the sleep is controlled/directed properly thamO guNam will subdue and satthva guNam will increase. Too much sleeping is considered to be directly related to increased thamO guNam and one should try to improve that by regulating ones routines by waking up early in the morning and engaging the mind and body in bhagavath/bhAgavatha kainkaryam. uththAnam means rising from the bed. Let us see the obstacles in this topic. Rising casually/slowly when AchArya or srIvaishNavas awake us. Translator's note: When srIvaishNavas wake us up, we should feel sorry to have made them wake us up instead of being alert and awake in their presence. Thus we should wake up at once with great rush. Rising hurriedly when materially minded people awake us. Waking up without remembrance/recitations of bhagavAn's glories and AchAryan's glories is an obstacle. Learned people usually wake up reciting "hari: hari:". Reciting "harir harathi pApAni" slOkam and dhyava mahA mantham is good for oneself. 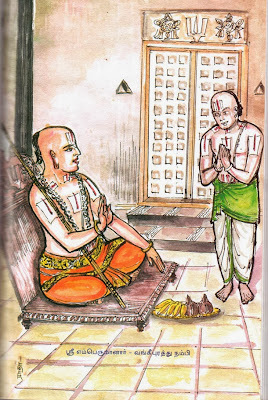 Translator's note: In sAsthram it is said that one should wake up in the early morning hours of brahma muhurtham (approx 4am) and remember the glories of srIman nArAyaNan. It is commonly seen in elders that as part of waking up, guru paramparA manthram "asmadh gurubhyO nama: ... srIdharAya nama:", rahasya thrayam (thirumanthram, dhvayam, charama slOkam), AchAryan's thanian, "harir harathi pApAni" slOkam, "kausalya suprajA" slOkam, nadAthUr ammAL's paramArtha dhvaya slOkams, gajEndhra mOksha slOkams and parathvAdhi panchaka slOkams are recited. It is an obstacle to focus on ones own anusandhAnam such as reciting dhivya prabhandham, sthOthrams, ithihAsa/purANams or japam when AchAryan or srIvaishNavas are waiting for us. Translator's note: When srIvaishNavas wait for us or arrive at our home, we cannot make them wait due to our own anusandhAnam - we should complete it as quick as possible, attend them satisfactorily and then continue with our anusandhAnam. When the AchAryan rests by keeping his head on ones lap, one should not rise suddenly saying the leg is aching. We can recollect bhattar-nanjIyar incident. bhattar (AchAryan) rested by keeping his head on the lap of nanjIyar (sishyan) - nanjIyar stayed without moving for a long time and when bhattar woke up he greatly praises nanjIyar for his strong will in serving the AchAryan. We can also remember karNan's incident with parasurAma. When karNa was learning archery from parasurAma, once parasurAma rested by keeping his head on karNa's lap. At that time, a bee starts stinging karNa and he stays unmoved. This incident is found in mahAbhAratham. It is an improper conduct to rise and leave a srIvaishNava gOshti in the middle and is considered as an insult to the gOshti. Translator's note: In dhivya prabhandha gOshti or kAlakshEpa gOshti, it is always better to enter at the beginning and stay until the end. People entering and leaving in the middle is a distraction for others too. It is an obstacle to wake up srIvaishNavas by shouting at them. To wake up srIvaishNavas or to ask srIvaishNavas to move from one place to another, they should be humbly approached and requested submissively. It is an obstacle to simply wake up the AchArya. Translator's note: One should wake up before the AchAryan and wait for the AchArya to wake up. One cannot force the AchArya to wake up. We can recollect the incident in bhattar's life. It is shown in thiruppAvai 8th pAsuram 4000 padi vyAkyAnam of Ay jananyAchAryar that all the srIvaishNavas would wake up early, decorate themselves, go and wait at the doorsteps of bhattar and humbly wake him up. Since bhattar was the dear son of AzhwAn/ANdAL and the adopted son of srIranganAthan/srIranganAchiyAr and was a matchless scholar and the leader of the sampradhAyam, the sishyas were greatly admiring him and serving him during his time. Not waking up before the AchAryan wakes up is an obstacle. One should go to sleep after the AchArya sleeps comfortably and wake up before the AchArya wakes up and ensure all his needs are satisfied. Other sishyas of ones AchArya are called "sabrahmachAris" (class-mates). They should be treated with great respect as well. One should not yawn in front of them, snapping the hairs from the head, stretching in front of them such that our hands/feet touches them, etc. These are considered as offenses and should be avoided. These class-mates are to be respected. Before they offer praNAms, one should first say "adiyEn" and offer them praNAms (obeisances). Not doing that is an obstacle. One should have great respect towards AchAryan, AchArya pathni (his wife) and AchArya puthras (sons). As soon as waking up, they should be offered praNAms and served properly. Not doing that is an obstacle. 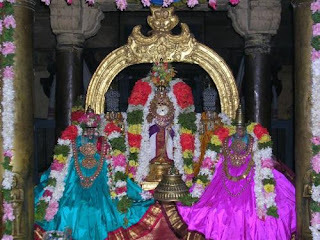 Please see the previous article at http://ponnadi.blogspot.in/2013/12/virodhi-pariharangal-5.html. vishayam generally means bhagavath vishayam (matters relating to bhagavAn). Anything contrary to that is an obstacle. Matters such as sabdha (sound), sparsa (touch), rUpa (vision), rasa (taste), gantha (smell), etc., which give material pleasures to our senses are a hurdle for bhahgavath vishayam. Translator's note: When one engages in sensual pleasures it increases the rajO and thamO guNam in oneself and naturally moves the person away from bhagavAn. AzhwArs have themselves cried out in many pAsurams that these wordly pleasuers are very powerful and they torment them constantly. Listening the names of bhagavAn is naturally good for the jIvAthmA. bhagavAn himself considers these as sukrutham (good acts) done by jIvAthmAs when they listen/utter the names of bhagavAn (even unintentionally). Not listening to bhagavAn's names or listening to other's names are obstacles. bhagavAn's archA vigrahams (and pictures/drawings of the same) are most enchanting. Looking at material bodies is an obstacle. Reciting others names instead of reciting bhagvAn's names is an obstacle. The legs given to us are to be used to go to bhagavAn's kshEthrams (dhivya dhEsams, etc). Using them in going to other dhEvathAs kshEthrams is an obstacle. 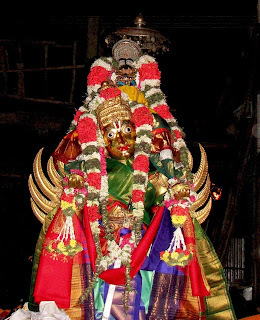 nammAzhwAr speaks about the glories of bhAgavathas in thiruvAimozhi 2.7 "payilum chudaroLi" (பயிலும் சுடரொளி) padhigam and 8.10 "nedumARkadimai" (நெடுமாற்கடிமை) padhigam. With this understanding, one should know that glorifying bhAgavathas is greater than glorifying bhagavAn. So, just worshipping bhagavAn's archA vigraham without serving bhAgavathas is an obstacle. Reciting bhagavAn's names instead of reciting bhAgavathas names is an obstacle. For example, it is explained by our pUrvAchAryas that the name "rAmAnuja" is greater than "nArAyaNa" and reciting emperumAnAr's names is most desired. 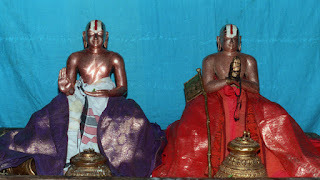 vaduga nambi once hears some one reciting "nArAyaNa" and says "One must recite 'rAmAnuja' only, simply saying 'nArAyaNa' is 'nAva kAriyam' (inappropriate act)" and walks away from that spot. Touching (the lotus feet of) bhAgavathas is good for oneself. But touching samsAris or being touched by them is a major obstacle. Translator's note: In parAsara bhattar's life, an incident is highlighted in this connection. While walking in the streets of srIrangam, a devotee of some other dhEvathA wearing colored dhOti comes close to bhattar and makes bhattar think that he may touched him. bhattar at once becomes very disturbed and goes to his mother ANdAL ammA and asks her for a remedy. She instructs bhattar to accept the srIpAdha thIrtham from a bhAgavatha who is not upavIdhI (one who does not wear yagyOpavIdham). bhattar somehow convinces one bhAgavatha who performs srIpAdham kainkaryam to namperumAL to present their srIpAdha thIrtham and feels satisfied. If, bhattar who is namperumAL/nAchiyAr's adopted son himself fears so much for the touch of samsAris, we can understand how careful we should be. thuLasi is very dear to emperumAn. But we should only smell the thuLasi leaves that are offered to bhagavAn. Smelling thuLasi that is not used in worshipping the lotus feet of bhagavAn is an obstacle. Translator's note: Everything animate and inanimate is owned by bhagavAn and exist for the pleasure of bhagavAn only. They should be first offered to bhagavAn and then accepted as prasAdham - nothing can be independently enjoyed by us. visvAsam means firm faith. Here we are looking at firm faith in upAyam for mOksham. Our pUrvAchAryas have explained based on sAsthram that bhagavAn is the apt upAyam for mumukshus. Translator's note: The same principles are explained by mAmunigaL in the vyAkyAnam for piLLai lOkAchAryar's mumukshuppadi sUthram 116 while explaining "pERu thappAthenRu thuNinthirukkaiyum" (பேறு தப்பாதென்று துணிந்திருக்கையும்) - one should be firmly faithful that the desired goal of eternal bhagavath kainkaryam will be achieved. 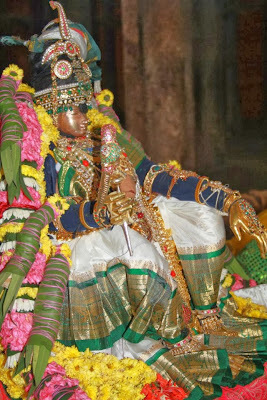 prapatthi is the act of praying to emperumAn to be the upAyam. It is simply the state of mind accepting bhagavAn as the upAyam. It is a very simple step. Yet, this is all that is required from our part. One should not think that "oh! This is a very simple step. How will this simple act make bhagavAn become upAyam?". Having such thoughts is an obstacle. upEyam is the result of pursuing upAyam. For srIvaishNavas, eternal kainkaryam in paramapadham (srIvaikuNtam) is the ultimate goal. And this kainkaryam in paramapadham is most wonderful and unimaginable to achieve by ones own self-efforts. nammAzhwAr says in thiruvAimozhi 5.1.7 "ammAn AzhippirAn avan evvidaththAn yAnAr" (அம்மான் ஆழிப்பிரான் அவன் எவ்விடத்தான் யானார் - My lord is the one who holds chakram in his hand - how great he is and how lowly I am) out of great joy that bhagavAn blessed him. So, one should not think of his greatness and we may not achieve kainkaryam to him because of our meekness - that is an obstacle. There are so many obstacles in samsAram. Fearing for those obstacles is an obstacle. Translator's note: In mumukshuppadi charama slOka prakaraNam, while explaining "sarva pApEbhyO mOkshayishyAmi mA sucha:", piLLai lOkAchAryar beautifully highlights bhagavAn's promise that all obstacles will be removed by him. mAmunigaL has expertly explained these principles in the vyAkyAnam. Not having faith in charamOpAyam (ultimate upAyam) is an obstacle. Both prapatthi and AchArya abhimAnam are explained as charamOpAyam. For prapatthi one should not consider that its a simple act and how will this simple act earn us eternal kainkaryam? For AchArya abhimAnam, one should not consider AchAryan is also a human like us, how will we help us get mOksham? Both are to be avoided. Translator's note: piLLai lOkAchAryar explains in mumukshuppadi charama slOka prakaraNam that "sarva dharmAn parithyajya" gIthA slOkam is called charama slOkam because it explains the charama upAyam (saraNAgathi). There is a grantham written by nAyanArAchAn piLLai which explains the glories of emperumAnAr (as AchArya) and is named charamOpAya nirNayam. We should understand that kainkaryam to emperumAn is the fitting action for our nature. kainkaryam is karthavyam - to be pursued naturally. Performing kainkaryam just as following vidhi (rules) is an obstacle. kainkaryam should be done with great love. nammAzhwAr says in thiruvAimozhi 10.8.10 "uganthu paNi cheythu" (உகந்து பணி செய்து - serving with love). Performing kainkaryam without such love is an obstacle. Translator's note: We have already seen the true nature of kainkaryam in previous definitions - "bhagavath anubhava janitha prIthi kAritha kainkaryam" (பகவத் அநுபவ ஜநித ப்ரீதி காரித கைங்கர்யம்) - one experiences bhagavath guNam, etc., that leads to loving attachment and that leads to kainkaryam. If it was simply done without attachment it is against the svarUpam of jIvAthmA. Citing ones pArathanthriyam not being anxious during kainkaryam is an obstacle. One should think "this is emperumAn's kainkaryam; we should complete it properly; we should not be committing mistakes and so on" - such thoughts will naturally lead to anxiety. Even during our thiruvArAdhanam at the end, everyone recites "upachArApadhEsEna kruthAn - apachArAnimAm sarvAm kshamasva purushOththama" (உபசாராபதேசேந க்ருதாந் - அபசாராநிமாம் ஸர்வாம் க்ஷமஸ்வ புருஷோத்தம) - I started doing kainkaryam to you but ended up committing many mistakes in process, you being the best among purushas, kindly forgive me. Being casual without any anxiety is an obstacle. 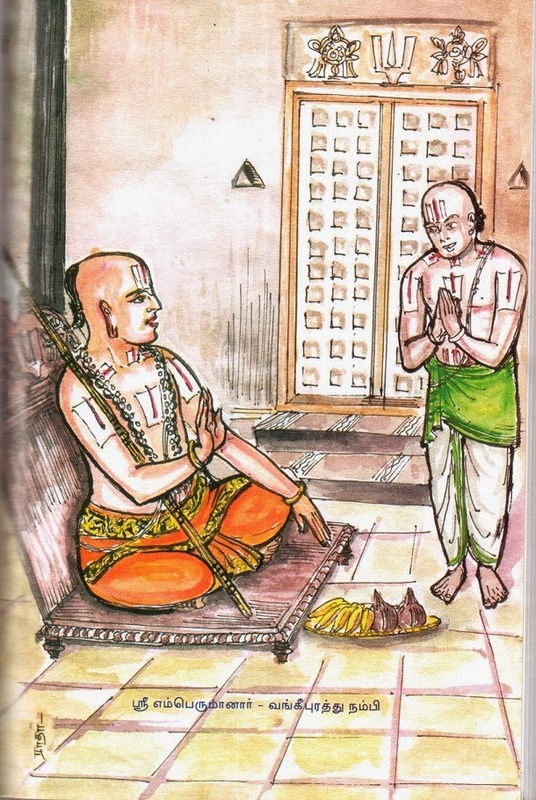 Translator's note: When kaNNan emperumAn visited vidhura's palace, vidhura was filled with anxiety that he offered the banana peels to emperumAn. Yet kaNNan emperumAn greatly appreciates vidhurAzhwAn's loving service. This is why vidhurAzhwAn is called "mahAmathi" - one who is greatly knowledgable - for being anxious to serve emperumAn. Considering ones anushtAnam as sAdhanam (upAyam) is an obstacle. svAnushtAnam (ones anushtAnam) includes karmAs that are ordered by bhagavAn as essential. Not performing such acts will lead to accumulation of sins. But performing them will not add any pious karmA - they are mandatory. One should not consider such anushtAnams as upAyams that will force emperumAn to give us mOksham. vihitha karmA includes sandhyAvandhanam thrice a day, thiruvArAdhanam for home perumALs, pithru tharppaNam, etc. nivruththi means renunciation/being detached. One who accepted emperumAn alone as upAyam will have to give up all other upAyams. bhagavAn says in gIthA charma slOkam that "sarvadharmAn parithyajya" (ஸர்வதர்மாந் பரித்யஜ்ய) first give up all upAyams and then "mAmEkam charaNam vraja" (மாமேகம் சரணம் வ்ரஜ) surrender unto me only. So, according to this, one should fully give up attachment to all other dharmams (upAyams such as karma, gyAna, bhakthi yOgams) and accept bhagavAn alone as the supreme dhramam. Translator's note: Our AchAryas establish that srIman nArAyaNan alone is supreme dharmam as cited in mahAbhAratham "krishNam dharmam sanAthanam" (க்ருஷ்ணம் தர்மம் ஸநாதநம்) - kaNNan emperumAn is the eternal dharmam and srI rAmAyaNam "rAmO vigrahavAn dharma:" (ராமோ விக்ரஹவாந் தர்ம:) - srI rAma is embodiment of dharmam. piLLai lOkAchAryar majestically explains this in mumukshuppadi sUthram 213 "dharma samsthApanam paNNap piRanthavan thAnE 'sarva dharmangaLaiyum vittu ennaippaRRu' engaiyAlE sAkshAth dharmam thAnE engiRathu" (தர்ம ஸம்ஸ்தாபநம் பண்ணப் பிறந்தவன் தானே 'ஸர்வ தர்மங்களையும் விட்டு என்னைப்பற்று' என்கையாலே ஸாக்ஷாத் தர்மம் தானே என்கிறது) - bhagavAn appears as krishNan to establish dharmam - when he says 'give up all other dharmams and accept me' that means he is the real/eternal dharmam. Even after understanding all of these, if one considers "would I get some sin for giving up these other upAyams?" that is an obstacle. This only shows the lack of faith in bhagavAn. The objective will also not be fulfilled due to such doubting. Performing such actions with doubt in emperumAn is also an obstacle. Translator's note: One should not think "what if my prapatthi fails? May be I should also do a little bit of karma, gyAna or bhakthi yOgam so that will back me up". It is explained that bhagavAn is like brahmAsthram. When brahmAsthram is applied, it will easily arrest the opponent. But if one doubts the powers of brahmAsthram and try to tie down the opponent with any additional protection, the brahmAstharam will withdraw itself. This is what happened when hanuman was arrested by brahmAsthram and later when the rAkshasas tied him with ropes, brahmAshtram let hanuman free. hanuman eventually goes to rAvaNa's court, warns him and sets lankA on fire subsequently. Giving up other upAyams simply due to ones own asakthi (incapability) is an obstacle. One should consider that other upAyams are not suitable for the svarUpam and thus give them up. Giving up other upAyams because one is capable to is an obstacle. Similar to above - they should be given up to fulfill the true nature - not for any other reason. Translator's note: For example, one may be able to give up karma yOgam and thinking that "Oh! I am very much in control, so I am giving up karma yOgam" - this is not good either. One should also not boast about giving up attachment to all upAyams - that is an obstacle too. If one is able to do that, that is natural for jIvAthmA and happens by the grace of emperumAn and AchAryas - one should not praise oneself for doing that and think that "I have given them all up! how great?". One should constantly remember, piLLai lOkAchAryar's mumukshuppadi sUtram 271 - "karmam kainkaryaththilE pugum; gyAnam - svarUpa prakAsaththilE pugum; bhakthi prApya ruchiyilE pugum; prapaththi - svarUpa yAthAthmya gyAnaththilE pugum" (கர்மம் கைங்கர்யத்திலே புகும்; ஞானம் - ஸ்வரூப ப்ரகாசத்திலே புகும்; பக்தி ப்ராப்ய ருசியிலே புகும்; ப்ரபத்தி - ஸ்வரூப யாதாத்ம்ய ஞானத்திலே புகும்). mAmunigaL beautifully explains the necessity for performing all such activities out of compassion towards whole community (if great persons give up these vihitha karmAs, others will follow and simply fall down) - yet one should never consider them as upAyam - they are done as kainkaryam. Whatever karmA done (like sandhyAvandhanam, etc) - they will become part of kainkaryam towards emperumAn. Whatever acquired through gyAna yOgam will lead to the enlightenment of the soul. Whatever performed as part of bhakthi will help improve our loving attachment towards bhagavAn. And finally the prapatthi will fit into the intrinsic nature of jIvAthmA in accepting bhagavAn alone as upAyam. Please see the previous article at http://ponnadi.blogspot.in/2013/12/virodhi-pariharangal-4.html. 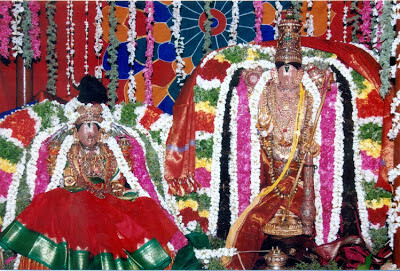 svasvarUpam means jIvAthmA's true nature. jIvAthmA is understood to be made of of gyAnam and also has gyAnam (knowledge), sEshathvam (servitorship) and pArathanthriyam (being fully controllable). gyAnam means knowledge. One who has knowledge should understand everything as it is. Let us see the obstacles in this topic. Of any object, there is gyAnam (true knowledge), gyAna anudhayam (lack of any knowledge or knowledge-less state), anyathA gyAnam (misunderstanding the attribute of the object - considering a conch as yellow in color) and viparItha gyAnam (misunderstanding the object itself - considering a pillar to be a man). Of these gyAna anudhayam, anyathA gyAnam and viparItha gyAnam are obstacles. Translator's note: We will understand this with the following simple examples. gyAna anudhayam - not knowing that AthmA is a sentient (knowledgable) entity and thus different from body (which is insentient) is the state of total lack of knowledge. anyathA gyAnam - misunderstanding that the AthmA is subservient to dhEvathAs other than srIman nArAyaNan is the state of misunderstanding the sEshathvam of the AthmA. viparItha gyAnam - misunderstanding the jIvAthmA to be independent is the state of misunderstanding the nature of jIvAthmA himself. When emperumAn is enjoying the jIvAthmA, if he vanquishes the sEshathvam of the jIvAthmA, i.e., if he places the jIvAthmA at a higher position and himself accepts a lower position and attempts to serve the jIvAthmA, the jIvAthmA should not backtrack claiming that he should always be subservient reflecting on sEshathvam. Such backtracking is an obstacle and it will be a hindrance for bhagavAn's enjoyment. sEshathvam means being subservient or secondary to bhagavAn and being ready to serve him. For example, it is normally seen (in our traditional lifestyle) that a woman serves her husband in many ways. But if the husband out of great love and affection serves the wife, the wife should not pull back and say "No! No! you cannot serve me. I have to serve you!" - that is a hindrance towards the husband who would derive great joy by serving his wife. Between paramAthmA and jIvAthmA there is barthru (husband) - bhAryA (wife) relationship. In this sense, jIvAthmA (being the wife) is suppose to serve bhagavAn. But if bhagavAn wants to derive pleasure by serving the jIvAthmA, the jIvAthmA should facilitate that having bhagavAn's pleasure in mind. This same principle is explained by piLLai lOkAchAryar in mumukshuppadi sUthram 92 with the same words as in the vyAkyAnam here. sEshan (servitor) means one who increases the glories of the sEshi (master). pArathanthriyam means being at full disposal of the master just like achith (Translator's note: if one places his watch on the table or tie it in his hand, the watch will not question the owner - jIvAthmA should be like that towards emperumAn) generally. But as cited in previous point, when emperumAn wants to enjoy the jIvAthmA, the jIvAthmA cannot stay like a stone without any reaction. The jIvAthmA should respond appropriately to increase the pleasure of bhagavAn. Not doing that is an obstacle. (Translator's note: When kusElan went to see kaNNan emperumAn, emperumAn massages kusElan's feet and serves him well to which kusElan agrees since that is pleasing to emperumAn. Similarly, when emperumAn wants to serve nammAzhwAr, he takes AzhwAr's right foot and starts massaging that with great joy. AzhwAr is initially perplexed at emperumAn's act but then he realizes thats what emperumAn wants. So, after a while, AzhwAr withdraws his right foot and presents his left foot to emperumAn. emperumAn becomes greatly delighted and his joy is doubled). So, not responding to emperumAn's subservient actions citing ones own pArathanthriyam is an obstacle. Considering bhAgavatha sEshathvam as secondary (and bhagavath sEshathvam is primary) is an obstacle. We are naturally subservient to bhagavAn. This should further progress into manifesting servitorship towards bhAgavathas. bhagavAn himself relishes more when one serves his devotees more than him. So, there is no reason to consider bhAgavatha sEshathvam as any less important. Doing that is an obstacle. Same thing applies in AchArya's case as well. Translator's note: One should be totally surrendered to ones own AchArya and serve him in all cases. piLLai lOkAchAryar highlights the importance of being fully surrendered to ones own AchArya in srIvachana bhUshaNam elaborately. mAmunigaL brings out the essence of this principle in upadhEsa rathina mAlai. parasvarUpam means true nature of paramAthmA. bhagavAn is supreme, omniscient, omnipotent, the master of all universes, one who has no blemishes and one who is filled with all auspicious qualities. Let us see the obstacles in this topic. Becoming attached to matter and material pleasures is an obstacle. This prakruthi (matter) is like a screen which hides the true nature of bhagavAn. prakruthi is made of three guNas (qualities) - sathvam (goodness), rajas (passion) and thamas (ignorance). Becoming subservient to bodily pleasures will keep us away from bhagavAn. When sathva guNam raises in a person, this body will be used effectively to understand the true nature of bhagavAn. But when rajO/thamO guNam raises, the same body will lead us away from understanding bhagavAn. Thus, becoming subservient to bodily enjoyment is an obstacle. Considering materially minded persons as supreme is an obstacle. Even dhEvathAs like brahmA, rudhran, etc are caught in the vicious cycle of birth and death. thoNdaradippodi AzhwAr says in thirumAlai 10 "nAttinAn dheyvangaLAga ath dheyvanAyagan thAnE" (நாட்டினான் தெய்வங்களாக அத் தெய்வநாயகன் தானே), all dhEvathAs are given specific tasks and they cannot be considered as supreme. Not considering that "these dhEvathAs are also controlled by emperumAn". Every one is ultimately at the total disposal of bhagavAn. So considering otherwise is an obstacle. Doubting his supremacy on observing his saulabhyam (simplicity) is an obstacle. vAthsalyam (motherly forbearance), saulabhyam (simplicity/easy accessability), sausIlyam (magnanimity), etc., are most desirous qualities in bhagavAn. These are to be greatly cherished. But if one considers "since bhagavAn is easily accessible, he should also be like me (human) only", that is an obstacle. Translator's note: gIthAchAryan says in gIthai (9.11) "avajAnanthi mAm mUdha..." - foolish men consider me human (during my avathArams) and they do not understand my supremacy. Havnig agyAnam and anyathA gyAnam in bhagavath vishayam is also an obstacle. Translator's note: One must properly understand bhagavAn's parathvam (supremacy) and saulabhyam (simplicity). Not having such proper understanding will lead to bhagavath apachArams. pleasures/recollections from dhEha vAsanA (bodily impressions) is an obstacle. Our impressions from previous joyful bodily experiences through the sense organs will remain even subsequent to the actual experience. This vAsanA (impression) is dangerous and this will lead to ruchi (taste). Translator's note: vAsanA is sub-conscious impressions and ruchi is intentional desires. pleasures/recollections from the ones who are related to the body - wife, children, wealth, etc., are an obstacle and will limit AthmAnubhavam. ruchi (taste) derived from vAsanA (impressions) is also an obstacle. It is commonly said that "A cat which tasted the milk will return to steal the same". Translator's note: Once our body enjoys the pleasures and comforts, it is difficult to give up the same and have control over the senses. That is why the great sages guided us towards renunciation instead of sense gratification. Any amount of gratification of desires will not fulfill such desires and would rather only increase the desires further. parAnubhavam means understanding truly and experiencing/enjoying the supreme lord's svarUpa (nature), rUpa (forms), guNa (auspicious qualities), vibhUthi (wealth). bhagavAn has five prakArams (forms) - para (in paramapadham), vyUha (vAsudhEva, sankarshaNa, pradhyumna and anirudha, kshIrAbdhi nAthan), vibhavam (many incarnations like srI rAma, krishNa, etc), antharyAmi (all pervading supersoul) and archai (deity forms). Among these, in current scenario, archAvathAram can only be experienced/enjoyed by our senses as mentioned by thirumangai AzhwAr in thirunedunthANdagam 10 as "pinnAnAr vaNangum chOthi" (பின்னானார் வணங்கும் சோதி) - worshippable by the future (after vibhavAvathArams ending with kaNNan emperumAn) generations. Now, the others can only be understood through mAnasa sAkshAthkAram (through the mind). anubhavam (experience/joy) leads to attachment/love towards bhagavAn. That love kindles loving kainkaryam (service) to him. All of these are part of anubhavam - anything which hinders such anubhavam is an obstacle. Let us see the obstacles in this topic. Self-centered activities are obstacles. nammAzhwAr says in thiruvAimozhi 3.2.1 "annAL nI thantha Akkaiyin vazhi uzhalvEn" (அந்நாள் நீ தந்த ஆக்கையின் வழி உழல்வேன்) - I am being tormented by this body and senses which are given by you (to facilitate the path of upliftment). Instead of using the body and senses towards upliftment, using that for self-centered activities will be an obstacle for bhagavath anubhavam. Feeling jealous on hearing the auspicious qualities of emperumAn is an obstacle. Due to ones own time immemorial sins, one may feel jealous on hearing the glories of bhagavAn like sisupAlan, dhuryOdhanan, etc. That is an obstacle. Feeling comforted by hearing about others (samsAris, ones who are demoniac, etc) is an obstacle. Being overwhelmed by his supremacy and leaving him is an obstacle. 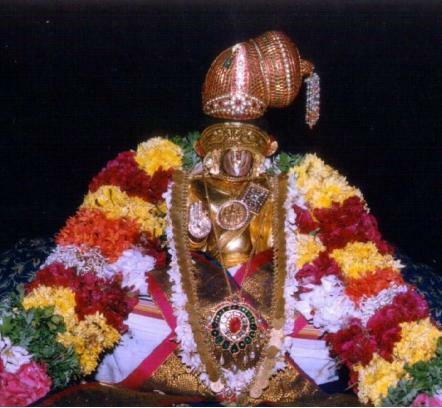 thirumangai AzhwAr says in thirunedunthANdagam 21 "avarai nAm dhEvarenRanjinOmE" (அவரை நாம் தேவரென்றஞ்சினோமே) - I was scared thinking that he is the supreme. While in AzhwAr's case it was divine interaction between him and emperumAn - it is beyond questioning, but it is generally recommended that feeling overwhelmed about his supremacy and moving away from him is an obstacle. samslEsham means having anubhavam with emperumAn. This could be mAnasa anubhavam (in the mind) or prathyaksha anubhavam (face-to-face). Somehow enjoying with emperumAn together is called samslEsha. This is very similar to parAnubhavam discussed in 27th point. Let us see the obstacles in the topic. Being overwhelmed by his supremacy and giving up his association is an obstacle. Already discussed in the last item in 27th point. Being satisfied with bhagavAn's qualities and avoiding his association considering AthmA's insignificance is an obstacle. This is explained as considering that such insignificant AthmA associating with bhagavAn will minimize bhagavAn's qualities and such feelings will be a hurdle for ones association with bhagavAn. This state is referred to as "vaLavEzhulagu thalaiyeduththal" () - being overwhelmed by emotions in vaLavEzhulagu (thiruvAimozhi 1.5 padhigam). nammAzhwAr says in thiruvAimozhi 1.5.7 "adiyEn chiRiya gyAnaththan, aRithalArkkum ariyAnai - kaNNanai - adiyEn kANbAn alaRRuvan, ithanil mikkOr ayarvuNdE" (அடியேன் சிறிய ஞானத்தன், அறிதலார்க்கும் அரியானை - கண்ணனை - அடியேன் காண்பான் அலற்றுவன், இதனில் மிக்கோர் அயர்வுண்டே) - I am very ignorant and he is most difficult to see even for great sages and incarnated as kaNNan - I am crying out to see him - what is more foolish than this act? Such interactions of AzhwArs with emperumAn should be understood as great loving exchanges between them. But for us, we should not avoid association of emperumAn considering our defects. Approaching bhagavAn without the purushakAram (recommendation) of srImahAlakshmi thAyAr is an obstacle. bhagavAn is supremely independent and uncontrollable by any one. If we approach him directly, as nammAzhwAr says in thiruvAimozhi 1.4.7 "en pizhaiyE ninainthu aruLAtha thirumAl" (என் பிழையே நினைந்து அருளாத திருமால் - simply considering my defects, srIman nArAyaNan did not bless me), bhagavAn may push us down in to samsAram again per our karmA. But if we go with the recommendation of thAyAr, our desire will be easily fulfilled. purushakAram means recommendation. Her being the mother of everyone, ensures that bhagavAn forgives our mistakes (just like a father will forgive the mistake of the child based on mothers's recommendation). This purushakAram is the nature of pirAtti and ignoring such purushakAram is an obstacle. Translator's note: In this world, AchAryas represent thAyar and they facilitate us in easily approaching him. Considering that bhagavAn is too difficult to attain and avoiding his association is an obstacle. Translator's note: While bhagavAn may be difficult to achieve for the ones who believe in their self-efforts, he is very easy to achieve for the ones who fully surrender unto him through an AchArya. vislEsha means separation from something dear. From the vyAkyAnam it can be guessed that vislEsham itself is an obstacle. Not having enough devotion or staying normal during separation are obstacles. "bhakthi pAravasyam" (being fully drenched with devotion for bhagavAn) can be understood "paraguNAvishta:" (பரகுணாவிஷ்ட: - being possessed by bhagavAn's qualities), nammAzhwAr's periya thiruvanthAdhi 34 "kAlAzhum nenjazhiyum" (காலாழும் நெஞ்சழியும் - legs cannot stand on their own, heart melts completely) and nammAzhwAr's thiruvAimozhi 7.2.1 "kangulum pagalum kaNthuyilaRiyAL kaNNa nIr kaigaLAliRaikkum - enganE dharikkEn unnai vittu" (கங்குலும் பகலும் கண்துயிலறியாள் கண்ண நீர் கைகளாலிறைக்கும் - எங்கனே தரிக்கேன் உன்னை விட்டு - parAngusa nAyaki's mother saying about her daughter "My daughter does not sleep during day and night and is constantly crying and thinking how she is going to sustain herself without srIranganAthan"). This state of suffering due to separation is called pArvasyam. Staying normal without such suffering in separation from bhagavAn is an obstacle. gIthAchAryan says in gIthai 10.9 "machchiththA madh gatha prANA bOdhayantha: parasparam kathayanthas cha mAm nithyam thushyanthi cha ramanthi cha" (மச்சித்தா மத் கத ப்ராணா போதயந்த: பரஸ்பரம் கதயந்தச் ச மாம் நித்யம் துஷ்யந்தி ச ரமந்தி ச ) - My devotees constantly remember me, they hold me as their life breath and discuss my activities amongst each other. By such discussions of my divine activities constantly, they (both the speakers and the listeners) derive great satisfaction and pleasure. This act of sharing and discussing bhagavAn's activities and glories and thus being satisfied and joyful is generally called "bOdhayantha: parasparam". This is most desirous. The ones who participate in such discussions are called "uchAth thuNai" (உசாத் துணை - dependable companion). They will reduce the sorrows of separation in one's heart. By not engaging with such dependable companions in discussing bhagavath vishayam during separation will lead to more sorrows and is an obstacle thus. nammAzhwAr says in thiruvAimozhi 5.4.9 "chenjudarth thAmaraikkaN chelvanum vArAnAl - nenjidar thIrppAr iniyAr? ninRu uruguginREnE" (செஞ்சுடர்த் தாமரைக்கண் செல்வனும் வாரானால் - நெஞ்சிடர் தீர்ப்பார் இனியார்? நின்று உருகுகின்றேனே) - When the beautiful red lotus eyed srImAn does not arrive I am completely melting away by the sorrow of separation. Who will remove the sorrows from my heart now?